2012 marks the 50th anniversary season for the Houston Astros, and they have been celebrating by wearing a range of historic uniforms from their very colorful visual history. The club recently sported their 1965 "shooting star" throwbacks, capped off by the iconic "H Star" headwear that they wore from 1965-93, on both navy and orange caps. The franchise transitioned from Colt .45s to Astros in the winter of 1964 and the spring of 1965. After looking at multiple images from this time it has occurred to me that the club didn't have a firm plan in place for the design of their caps. Players started reporting to Spring Training in Cocoa Beach, Florida on February 15, 1965. I've located a photo of former Yankee Bob Turley getting loose two days later—this was five days before veterans reported—so it stands to reason that this is one of the earliest on-field images of the 1965 Astros. 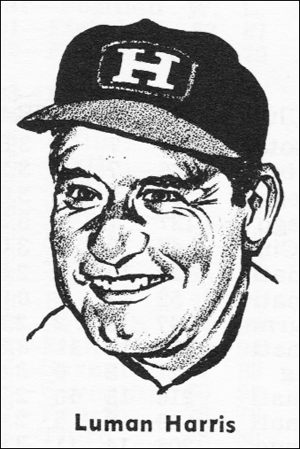 Note the "H" on his cap, a design which was worn in Spring Training but never saw the light of day in a regular season game. Many images exist of this plain H headwear, all taken during Spring Training in 1965. To confuse the situation further, I've also found images from that Spring Training that depict players wearing a very plain star with no H on their caps. The following configuration seems to indicate a patch that's been placed over another decoration, quite possibly the ".45s" design worn by the franchise from 1962-64. It could well be a bad airbrush job too. Confused? Here is an image of Hall of Famer Nelson Fox, taken during that same 1965 Spring Training. His star is sewn directly on to the cap he's wearing. Let's fast forward a few weeks. The Astrodome will soon be hosting its first game and the Astros have engaged the ageless Leroy "Satchel" Paige in a publicity stunt—he has been called upon to throw what was described as the "first baseball ever pitched at the Astrodome." The following photos depict him in an empty Dome with a dirt infield and an unfinished scoreboard in the background. We can assume that this was taken in the weeks leading up to the first game played in the Dome, an exhibition match between the declining New York Yankees and the newly christened Astros, played on April 9. Paige is wearing a cap featuring a completely different slab-serif "H," sewn onto a rectangular patch which has been sewn on to the headwear. The following close-up provides a great view. One more image, taken from The Sporting News Dope Book, 1965 edition-a sketch of Astros manager Luman Harris, featuring the design worn by Satchel Paige above. Licensing and revenue opportunities that would have coincided with the launch of a new team identity were not on the radar in 1964-65, so a scenario such as this would be unthinkable today. When the club finally figured out what they wanted to do, they came up with a design that had great staying power, lasting 29 seasons. "Brooklyn" on uniforms, one color…so very 1937.